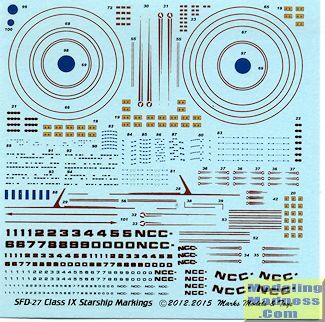 This latest decal sheet from Starfighter Decals has markings for four different classes of ships. 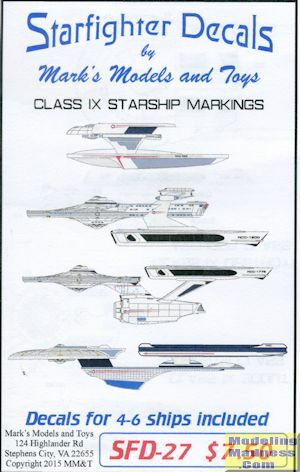 These are part of the later Star Trek Universe as you see in the movies instead of the usual TV series types. One wonders when the later movie ships will be done, but perhaps the licensing fees are too onerous. Ships covered are the Battlecruiser, Cruiser, Destroyer, and Scout. The decals themselves provide all sorts of detail stuff including hull numbers, but no names, so you will have to come up with those. In fact the instructions state that there are more markings than one will probably use, but they are there just in case. As with the earlier sheet, these are standard water slide markings. Included with the sheet are several pages of placement information. These are in full color and will show you exactly where all the parts go. The decals are superbly printed and crisply done. If this falls into your area of interest, I suggest you pick this one up.